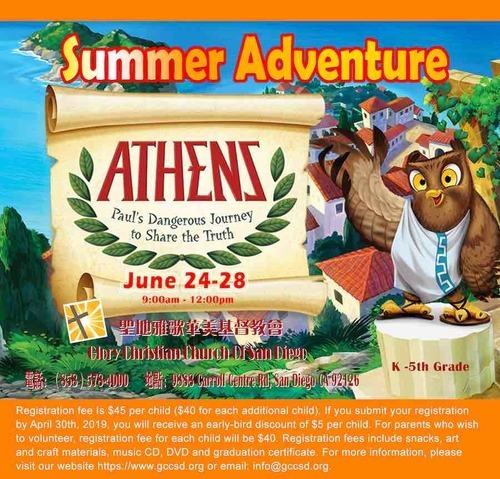 Welcome to GLORY Christian Church of San Diego VBS page. We are a bilingual (English and Chinese) community church, located in Miramar, San Diego. We emphasize bible teachings, missions, outreach, as well as children, youth and college ministries. If you are seeking a Chinese church or wish to learn more about God, please come join us on Sunday mornings for worship and Bible studies. Registration fee is $45 per child ($40 for each additional child). If you submit your registration by April 30th, 2019, you will receive an early-bird discount of $5 per child. For parents who volunteer, registration fee is $40 per child.